Pyritized ammonites cut by Gary Wilson. Note that the surfaces are domed and smooth without openings. From the photo, it appears there are deep openings in these stones between the sutures. Ha! Not so. In fact the stones are domed and completely smooth. The impression of depth arises from the different colors of pyrite in the fossils. Note too that pyrite, also known as "fool's gold," is a slightly more silvery grey color than is apparent from the photo. 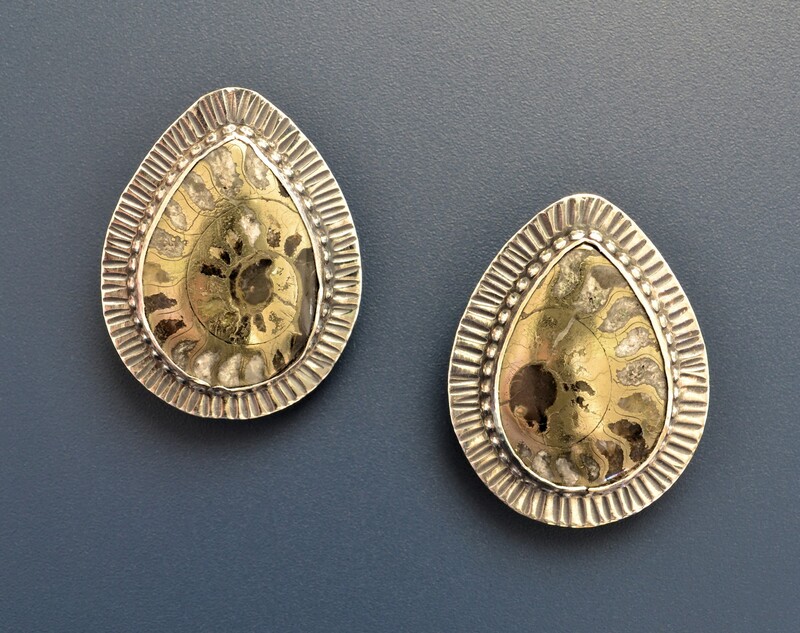 Gary sliced a single ammonite longitudinally to obtain the mirror image patterns for these earrings. This specimen likely came from the Volga River area in Russia. 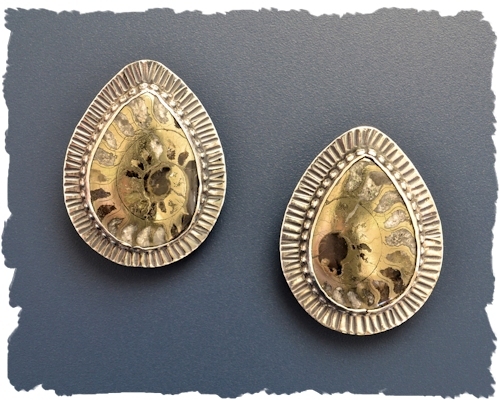 When we think of ammonites we probably are more apt to think of the colorful agatized Moroccan ammonites like the ones in my Ammonite Earrings here where you will also find a little description of the creatures which left these gorgeous fossils. (You can also use the search box at left to find other examples of jewelry I've made with ammonites). The more subtle color of these earrings makes them complement even more colors and clothing styles. They will add a bit of sparkle and a ton of fascinating history to your wardrobe. Please order these one-of-a-kind beauties today.